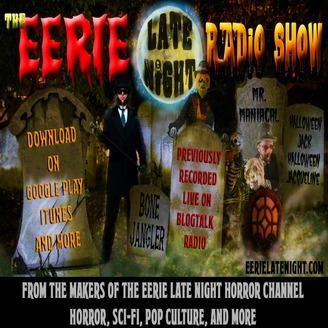 The Eerie Late Night Radio Network is a collection of internet radio shows by the horror hosts of The Eerie Late Night Horror Channel. 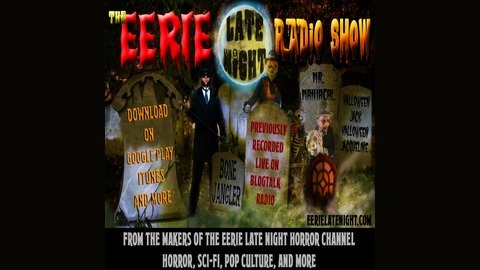 It’s flagship podcast, The Eerie Late Night Radio Show, is broadcast and recorded live on Blogtalkradio. Past shows are then added to our radio network and distributed. We also have included Mr. Maniacal’s INSANITY: Old Time Radio which are hosted versions of popular golden age radio shows. From time to time we will include other hosts podcasts as they are made available to us. So enjoy this audio journey into The Eerie Late Night!